Victor Bayne’s job as a PsyCop involves tracking down dead people and getting them to spill their guts about their final moments. It's never been fun, per se. But it's not usually this annoying. Vic has just moved in with his boyfriend Jacob, he can’t figure out where anything’s packed, and his co-worker is pressuring him to have a housewarming party. Can’t a guy catch a break? On a more sinister note, Vic discovers there’s absolutely no trace of him online. No trace of anyone else who trained at "Camp Hell," either. Everyone Vic knows has signed a mysterious set of papers to ensure his “privacy.” The contracts are so confidential that even Vic has never heard of them. But Jacob might have. What other secrets has Jacob been keeping? 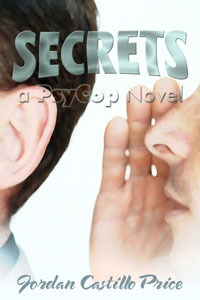 I really enjoyed the fourth story in the Psy Cop series. When Vic browses the internet, he realizes his name, the name of the psych training institute where he was institutionalized (Camp Heliotrope), and the names of others he knew there cannot be found. Jacob is asked to help solve an unusual sexual assault case. Vic is starting to learn more about his abilities. And everyone has secrets… even Jacob. Secrets is another fun story that introduces new characters and revisits old ones. Lisa Gutierrez, Vic’s second partner, is back and coming to terms with her psychic abilities. Crash, Jacob’s ex, knows about Jacob’s case and Vic reveals his jealous side. As always, Jacob can’t get enough of Vic.